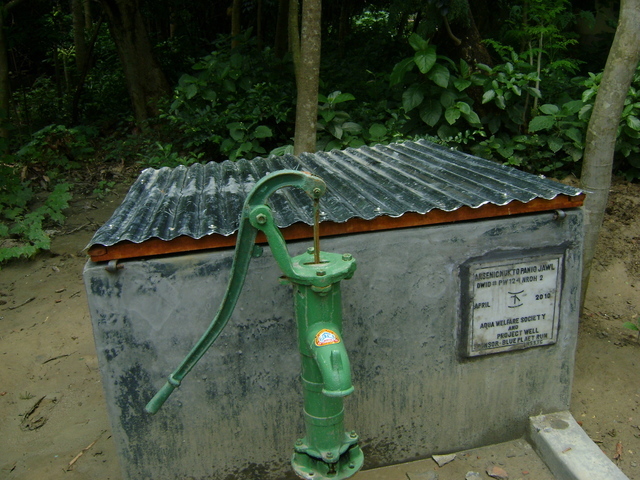 This is site for bore-dugwell #PW124NRDH2 located in the village Noradaha, the _______ Panchayet in Gaighata block of North 24 Parganas district. Shanti Biswas donated the site for the community. This well for reasons unknown gets dry most of the year. There may be some geomorphological or geological reason. This shallow modern dugwell is located on the higher side/bank of the oxbow lake. It is speculated that the water drains into the lake except when the water level of the lake is higher than the water table of this dugwell. Initially people were using this well, later on it has been abandoned due to being dry. Visited this site with the technical manager, project manager, awareness programmer and the maintenance personal to see the exact situation why three newly constructed bore-dugwells in the same village, Nordaha, are not working. These sites are located in one line along the main pathway of the viallge. And the fourth bore-dugwell that was located a little interior of the village was working fine. The technical manager assessed that the instructions were not followed by the user community that is to pump the well water out after construction for few days. It was not followed as a result the fine sand is still clogging the pores of the bottom 10 feet of the tube that is perforated. An awareness program comprising of user communities of all the three sites will be held on 10th September 2010 where all the above staff and also all the field workers will be present for it would be a learning experience for those who have just joined the organization. The boring part of the construction is complete. TDigging and housing is pending and will be completed by June. Following which the arsenic test and application of the disinfectant are due. The community will be trained to apply the disinfectant and field workers will visit the bore-dugwell for two years or until the user community feels confident to take the responsibility of the bore-dugwell. This well for reasons unknown gets dry most of the year. There may be some geomorphological or geological reason. This shallow modern dugwell is located on the higher side/bank of the oxbow lake it is speculated that the water drains into the lake except when the water level of the lake is higher than the water table of this dugwell. Initially people were using this well later on it has been abandoned due to being dry.